The ASEAN folding cartons market has gained significant impetus from the robust growth of small- and medium-sized enterprises (SMEs) and various other industries in ASEAN countries over the last couple of years. Since there is a free trade agreement between the ASEAN countries, most of the small and large scale industries need packaging materials in large volume, consequently boosting the demand for folding cartons. The preference for folding cartons is anticipated to increase further, thanks to the cost benefits, these cartons provide during transportation and handling of products. The rising demand for packaged and takeaway food products is also projected to influence the market for folding carton in ASEAN countries. However, the availability of flexible plastic packaging materials and rigid boxes at comparatively low prices may limit the uptake of folding cartons to some extent over the forthcoming years, reflecting negatively on this market. The opportunity in the ASEAN folding cartons market was worth US$2.8 bn in 2016. Rising at a CAGR of 7.10% between 2016 and 2024, the market is estimated to reach a value of US$4.9 bn by the end of 2024. The industrial food and beverages, homecare products, personal care, pharma and healthcare, and tobacco sectors are the key end users of the folding cartons in the ASEAN market. Among these, the food and beverages industry has emerged as the leading end user of folding cartons and is expected to remain dominant over the next few years, rising at a CAGR of 6.80%. In the food and beverage sector, these cartons find a robust usage in the packaging of fresh food products. Among other end users, the pharma and healthcare and the personal care industries are anticipated to witness a healthy rise in the adoption of folding cartons in the near future. The increasing middle-class population in ASEAN countries and the rising awareness pertaining to the beneficial properties of these cartons are likely to boost their uptake in these industries over the years to come. Solid bleached sulfate (SBS), coated unbleached kraft (CUK), uncoated kraft boxboard (UKB), and coated recycled board (CRB) are the three main types of materials, which folded cartons are produced of. 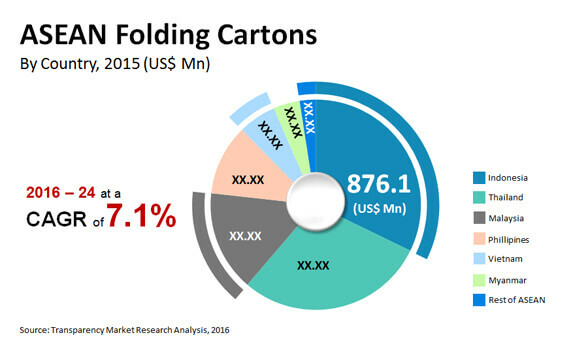 Among these, the demand for SBS-based folding cartons is significantly higher as compared to others. Analysts expect this segment to witness continued demand over the forthcoming years. However, in terms of revenue, UKB-based folding cartons are likely to fare better than others in the near future. Indonesia, among all the ASEAN countries, has surfaced as the key contributor to the ASEAN folding cartons market. Analysts estimate this domestic market to continue its leading streak over the next few years, expanding at a CAGR of 7.20% between 2016 and 2024. In Indonesia, the food and beverage sector has been reporting a strong demand for folding cartons and is likely to continue doing so in the near future. Thailand and Malaysia are also anticipated to provide promising opportunities to market players over the coming years. The ASEAN market for folding cartons is a highly competitive in nature. Some of the key players in this market are Amcor Ltd., AR Packaging Group AB, Huhtamaki Group, Mayr-Melnhof Karton Gesellschaft M.b.h., International Paper, DS Smith Plc, and Rengo Co. Ltd.
ASEAN folding cartons market is expected to be driven by the mounting growth of packaged and takeaway food products in ASEAN countries. The takeaway food industry is growing in ASEAN as it is now considered to be a new business avenue for investors to make money. Moreover, the number of expats and tourists is increasing every year in ASEAN. This group of people prefer having their daily meals from such takeaways which in turn intensifies the sales of folding cartons during the forecast period. Moreover, folding cartons used in bulk storing and transportation cost less compared to other packaging solutions which makes it profitable for such uses. Flexible plastic packaging and rigid boxes are still being adopted owing to their low cost nature and flexibility in comparison to folding cartons which can pose a major challenge in the ASEAN folding cartons market. This report provides forecast and analysis of the ASEAN Folding Cartons market. The study provides historic data of 2015 along with forecast from 2016 to 2024 based on volume (Thousand Tons) and revenue (US$ Mn). It includes drivers, restraints and the ongoing trend of the ASEAN Folding Cartons market along with their impact on demand during the forecast period. The report also comprises the study of opportunities available in the market for ASEAN Folding Cartons market. In order to provide the users of this report with comprehensive view of market, we have included detailed competitiveness analysis and company players. The competitive dashboard provides detailed comparison of ASEAN Folding Cartons market manufacturers on parameters such as company’s revenue, unique selling propositions and key strategic developments. The study encompasses market attractiveness analysis, by end use, material type and order type. Market statistics have been estimated based on average consumption and weighted average pricing of ASEAN Folding Cartons market by product type and the revenue is derived through regional pricing trends. Market size and forecast for each segment have been provided in the context of ASEAN market. The ASEAN Folding Cartons market has been analyzed based on expected demand of the various Folding Cartons products. Prices considered for the calculation of revenue are average prices obtained through primary quotes from numerous industrial packaging manufacturers, suppliers, and distributors. All key end users have been considered and potential applications have been estimated on the basis of secondary sources and feedback from primary respondents. Market numbers for the product type and application segments have been derived using the top down approach. The market has been forecast based on constant currency rates. A number of primary and secondary sources were consulted during the course of the study. Secondary sources include Factiva, Industrial Association, Packaging Digest, Packaging world, and Hoover’s, and company annual reports and publications. The report provides detailed competitive outlook including company profiles of key participants operating in the ASEAN market. Key players in the ASEAN Folding Cartons market include Amcor Limited, AR Packaging Group AB, HUHTAMAKI GROUP, Mayr-Melnhof Karton Gesellschaft M.b.h., International Paper, DS Smith PLC, and Rengo Co., Ltd.